If you like vibrant colors and great views, you’ll love Villa Amarilla. Both the interiors and exteriors are done in a Caribbean style with an Italian vibe and Moroccan influences. The staff is first-class, the views are breathtaking, and the amenities are top-notch. Stunning 9,000 square foot villa with panoramic of Shoal Bay and Scrub Island! 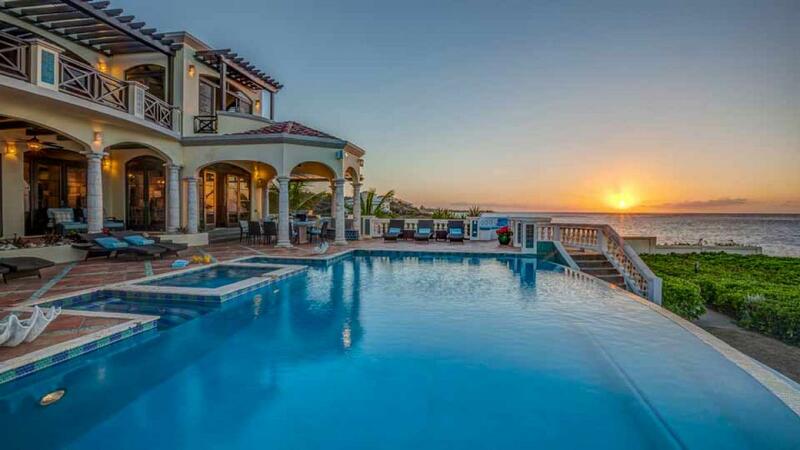 Villa Amarilla is a 9,000 square foot villa located on Anguilla’s Leeward north side, on the Sea Rocks of Island Harbour. The property overlooks some of Anguilla’s most beautiful reefs and has panoramic views of Shoal Bay Beach and Scrub Island. With spacious indoor and outdoor living and dining areas, Villa Amarilla offers ample room for a large group. The infinity pool stretches across the lower terrace with a wading area, in-pool lounges, and a hot tub. Guests can enjoy meals al fresco thanks to the dining gazebo, bar, BBQ, and outdoor kitchen with ocean views. In addition, there is a covered terrace between the outdoor living and dining areas where guests can enjoy a little shade. There is also an upstairs balcony with comfortable seating and even more dramatic views. The fully-equipped, air-conditioned gym sits apart from the main house. It features something for every exercise, including an Octane elliptical, True recumbent bike, yoga mats, free weights, and a body ball. There’s a 36” HD flatscreen TV, a stereo, and a docking station for background noise. A full bath, comfortable futon, lounger and massage table make this gym complete. The villa also has three outdoor showers with beautiful ocean views. Shoal Bay Beach, a two mile stretch of powdery, white sand and crystal clear water, is a short drive from the villa, and a small secluded beach is a short walk away. Two staircases lead from the pool deck down to the coast. Villa Amarilla’s design is Caribbean with an Italian influence. Its yellow stucco walls, turquoise shutters, and red tile roof were conceived by Anguilla’s own acclaimed architect Carl Richards. The cool island interiors have hints of Moroccan flair, and were created by the owners and award-winning Dallas interior designer David Salem & Associates. The stunning views are visible through the beautiful wrought iron and glass front door. The lapis blue floor of the entry hall blends with the seafoam-tiled double staircase, and the one-of-a-kind seashell chandelier adds a whimsical touch. The living room is attractively and comfortably furnished with a seating area in front of the flatscreen TV and a nook for conversation and card playing. A sound system runs throughout all the living areas, including the outdoor dining, living, and pool areas. The kitchen is state of the art with a GE Profile five-burner gas cooktop, double ovens, a microwave, a dishwasher, a spacious refrigerator and freezer, and a separate wine cooler. The indoor bar is equipped with an ice maker and a beverage center and leads to the dining room. The custom dining table seats twelve amongst sunset views. There is also an air-conditioned media room with a 60” plasma HD television, surround sound, and a Denon docking station. There is also a queen sofa bed. The washer and dryer are used only by housekeeping. The downstairs master bedroom is spacious and soothing, furnished with a king four-poster bed, elegant Scalamandre window treatments, a Moroccan-influenced bathroom with double vanity sinks, and indoor and outdoor showers. The East and West upstairs master bedrooms are identical to the lower level master in amenities and configuration. Both the fourth and fifth bedroom has two twin beds that can be made into a king. They also have ensuite bathrooms and closets with vanity tables. The four upstairs bedrooms all open onto the upstairs balcony, and the East and West master suites each have a private balcony with ocean views. All five air-conditioned bedrooms have breathtaking ocean views, air-conditioned ensuite bathrooms with dual vanities, walk-through closets, flatscreen HDTVs, and docking stations. They also have ceiling fans and screens. Villa Amarilla is quiet without being too secluded. It’s near Shoal Bay Village’s activities and restaurants as well as Scilly Cay, a small island and bar reached only by ferry. Guests are met at the airport or ferry dock on arrival. After securing a taxi or rental car they will be led to the villa.